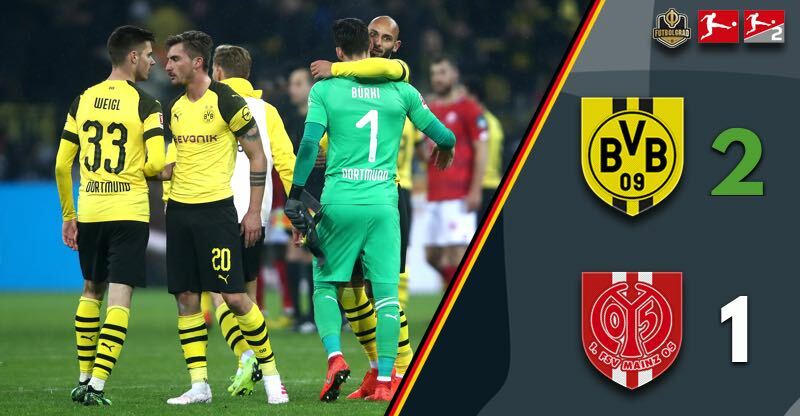 Dortmund v Mainz – Borussia Dortmund defeated Mainz 2-1 to restore their lead at the top of the Bundesliga in a tale of two halves. The hosts were dominant in the first half and took a 2-0 lead into the break courtesy of Jadon Sancho, but the second half was a nervy affair where they lost all control. Borussia Dortmund started on the front foot, fashioning their first chance from a short corner as Danny Latza turned the ball onto his own post. Another corner provided Dortmund’s second opportunity as Thomas Delaney headed straight at Florian Müller. Jacob Bruun Larsen was next to get involved with a shot over from distance sailing over the bar, but he would soon get another chance to put the hosts in front. Jadon Sancho produced a lovely pass over the defence with Bruun Larsen’s shot saved by Müller. It wouldn’t take long for Dortmund to take the lead, however, Marius Wolf’s long ball out of defence finding Mario Götze who squared to Sancho who made no mistake from close range. It was soon 2-0 with the young Englishman bagging his second. A bad pass from Pierre Kunde allowed Dortmund to break, but they couldn’t capitalise, Bruun Larsen dragging an effort wide from a tight angle. Mainz finally had their first good chance of the game just before half-time, Julian Weigl’s mistake pounced upon by Jean-Philippe Mateta, the striker found Karim Onisiwo whose clever back heel grazed the outside of the post. Mainz manager Sandro Schwarz replaced Kunde with Ridle Baku at the break and pushed Jean-Philippe Gbamin into midfield, but Dortmund’s dominance continued. Bruun Larsen broke free but couldn’t find a teammate, Sancho and Wolf then combining to set up Reus who shot straight atMüller. Mainz bounced back however with Jean-Paul Boëtius was the main instigator. The Dutchman has moved into his preferred attacking midfield role, winning a free kick from which he tested Roman Bürki with a low drive. 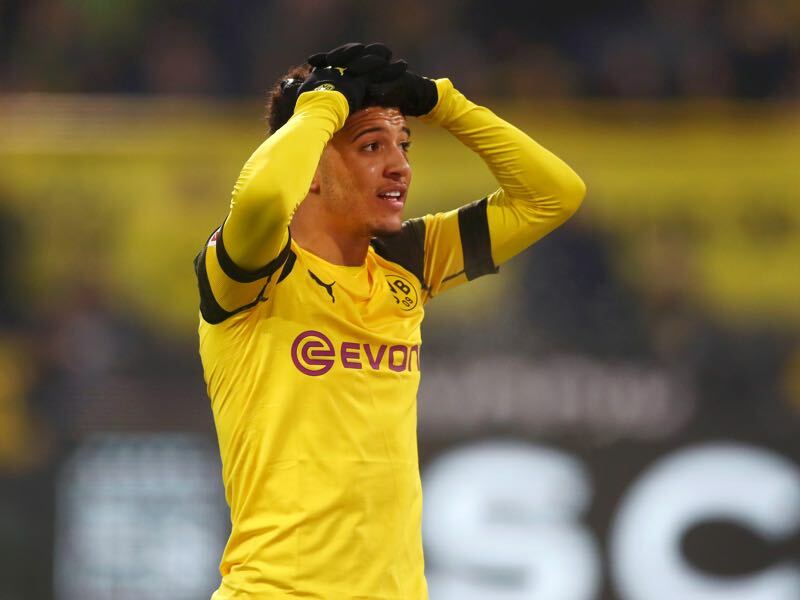 Boëtius had a shot from distance, Gbamin the next to try his luck as Dortmund lost their imitative and grip on the game. Lucien Favre responded by replacing Jacob Bruun Larsen with Maximilian Philipp, but it made little difference. The hosts were a shadow of the side that dominated the first half. Mainz’s proactive approach completely turned the game around as Dortmund looked more like the hesitant side that were embarrassed in Munich. Favre made a second switch in the 78th minute as Dan-Axel Zagadou replaced Marius Wolf. The Black and Yellows were increasingly looking for counter-attacking opportunities and went close to making it 3-0. Sancho broke free and picked out Marco Reus, but his scuffed shot went way wide. It proved to be a turning point as Mainz finally got the goal their second-half performance deserved. Onisiwo’s header forced a fine save fromBürki; the ball fell to Alexander Hack with his shot from a distance taking a deflection before falling to Quaison who made no mistake from close range. The visitors were clearly in the ascendancy with the noise in the stadium reflecting the tense nature of the situation. Anthony Ujah replaced Danny Latza as Mainz went close to an equaliser, a corner falling to Ujah and then Hack as Bürki made a save on the goal line. Favre’s final attempt to stop the onslaught saw Mario Götze make way for Ömer Toprak. It made little difference as Ujah went close to getting on the end of a through ball, fortunately for Dortmund and the capacity crowd he was unable to get a shot away as the hosts held on for a vital three points. Jadon Sancho was instrumental early on and scored twice to put Dortmund into a commanding lead. He was close to registering another assist in the second half as a trademark counter-attack saw him tee up Marco Reus who fired wide. It’s getting increasingly difficult to describe the English teenager without getting too repetitive. I haven’t seen anyone his age with such vision, unselfishness and technique, I can’t wait to see his career flourish. Dortmund restored their two-point lead at the top of the Bundesliga with Bayern München taking on Fortuna Düsseldorf tomorrow afternoon. The second half was ugly however and inexcusable after a dominant performance in the opening 45 minutes. They got the win, but the nature of the capitulation is a worrying sign for the weeks ahead. At the age of 19 years and 19 days, Jadon Sancho is the youngest player to score 11 goals in Bundesliga history. Roman Bürki has made nine saves against Mainz, more than in any other Bundesliga game this season. In the last nine games against Mainz Dortmund lost only once, on matchday 33 of the 2017/18 season (1-2).